finish is important, but sound the more so. My passion is the classical guitar, and I have borrowed ideas from the great masters. I model the body on Ramirez, the fan braces on Hernandez y Aguado, the brace dimensions on Romanillos and the fingerboard on Contreras. The neck is based on Farre, my headstock is my own and although I use a range of rosettes, my purflings and bindings are of my own design. I pay great attention to playability and sound. This means the greatest of care with the string length, the set up, the overall dimensions, the action and indeed with each individual fret. All backs and sides are thicknessed to 2mm, and the front tapers from 2.5mm on the treble side to 2mm on the base with a gradual reduction over the width of the front from one side to the other. Picture courtesy of Express and Echo Group (Exeter). To see scanned image of two page article, click HERE. 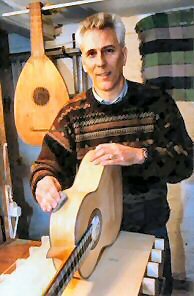 When making a guitar I offer two services; either a customer can come to my workshop and try the few that I hold in stock, (normally no more than four), or I will make to requirement. Either way, I stay with a customer until they are one hundred per cent happy with the instrument; making all the necessary adjustments to ensure that this happens. I am also prepared to consider other commissions as indicated in the pictures, where there are examples of instruments other than guitars.I do not normally hold these in stock, but will make to order.